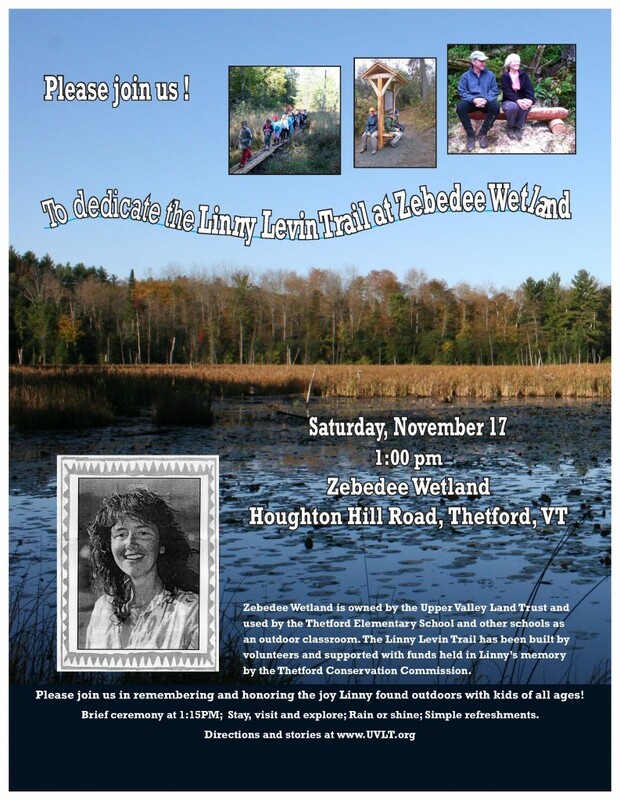 On November 17thÂ at 1pm we will gather at Zebedee Wetlands to celebrate a beloved community member, Linny Levin.Â Improvements to the existing trail were made using monies from a Memorial Fund held by the Thetford Conservation Commission in memory of Linny and it seems fitting that, in this way, she will continue to bring people and nature together. Please join us in remembering and honoring Linny. 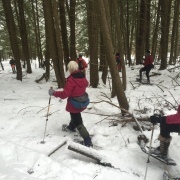 From points South:Â Take I-91 North toward St. Johnsbury.Â Take Exit 14 for VT-113 toward US 5/Thetford.Â Turn left off of the exit ramp onto 113 W and follow it for approximately 0.9 miles.Â Â Turn right onto Houghton Hill Road near the intersection at the top of the hill.Â Follow Houghton Hill Road for approximately a quarter mile – the parking area will be on the right hand side of the road. From points North: Take I-91 South toward Hanover.Â Take Exit 14 for VT-113 toward US 5/Thetford.Â Turn right off of the exit ramp onto 113 W and follow it for approximately 0.9 miles.Â Â Turn right onto Houghton Hill Road near the intersection at the top of the hill.Â Follow Houghton Hill Road for approximately a quarter mile – the parking area will be on the right hand side of the road. Overflow parking may take place along the right hand side of the road as long as vehicles are single file and the traffic lane is not blocked.Â Follow parking signs. For more information on the dedication check out the poster below and to track the progress we’ve made on the trail visit:Â search for ‘Zebedee’ here on our website. Kiosk Installed at Zebedee Wetlands Where Do You Love?